It's that time of year again when we head to Charleston for the ever growing Charleston Race Week. Last year, we were demo sailing the J/70 out and about on the race course and this year there are 56 registered to be on the starting line!!! How awesome is that? And on top of an extremely strong J/70 fleet, are the Melges 24, Melges 20 and Viper 640 fleets with 37, 34 and 37 teams as well. No question about it, that this will be another excellent event with everyone coming together for lots of racing in beautiful Charleston. We're here again working with our regular teams and some new ones from the J/70 fleet. We have some great new products and covers for J/70 teams and the Sail22 Support Trailer is fully stocked to service any of your needs. We have pre-orders ready for pick-up and will be based at Patriot's Point starting on Wednesday. As always, Harry, our director of marketing will be on site for greeting clients. On behalf of the whole Sail22 team, we're looking forward to seeing you soon! Here are a few images from Bacardi Miami Race Week to get you excited about the upcoming racing this week. I've been a bit swamped and haven't had a chance to get the images from Miami uploaded yet, but there are some great ones. Enjoy! All photo galleries are finally posted from Quantum Sails Key West Race Week 2012! I was out on the water for each day of racing and have tagged every image with a team name and sail number if possible. Click the link (in red) below a photo to be taken directly to the gallery with that tag. The Division 1 Gallery included the TP52, Farr 40, Mini Maxi, Farr 400, and IRC classes. Definitely an exciting course to be out on and the conditions were great during the week. The brand new McConaghy 38 owned by Rob & Sandy Butler with Marty Kullman driving. Ran going downwind. A favorite of mine! The Division 2 Gallery showcases the Melges 24 and Melges 32 classes. Always great one design racing with those fleets and fun to watch as well. Congratulations to Bora Gulari & his team on the Melges 24, West Marine Rigging New England Ropes and to John Kilroy and his team on Samba Pa Ti. Melges 24 Start at Key West Race Week. Congrats to Samba Pa Ti, winner's of the Melges 32 class and Boat of the Week! Bora Gulari and team headed to yet another win. They were tough to beat! The Division 3 Gallery includes the J/80's, Farr 30's, PHRF and J/Boats (J/109, J/122, J/111, J/120) classes. A big variety on this course for sure and great to see more one design classes on the water at the event! As always, Key West was great to see everyone, as it's always a bit of a reunion. We're already looking forward to next year! Looks like the Farr 30 Groovederci was having fun out there! Mental and Wicked, both J/111 boats were very competitive with each other. J/122 Teamwork headed to a class win! Sail22 had many requests from teams last week about the options we offer for Melges 24's and other boats while at Key West Race Week, so we've put together a summary of details to make things easier. Please click here for a Sail22 Melges 24 Options & Upgrades price list. As always, feel free to ask us questions. If you're interested in ordering anything, please give us a call at 547-889-0022 or send us an email at info@sail22.com. The Sail22 Speed Shop was extremely busy throughout December and early January in preparation for this past week at Quantum Sails Premiere Racing Key West Race Week. In late December, we picked up a brand new Melges 24 for a client, USA 829, and brought it directly to the shop to begin the customization process prior to her first splash in Key West. Here are a few of the tweaks we've made that can be made to any boat, new or old when they visit the Sail22 Speed Shop. Sail22 Foam Deck & Non-Skid Deck: Be nice to your crew with our custom cut Sail22 Foam Deck. No grit, lots of traction and easy on gear and lines. If the skipper likes a little more traction, then we offer the option for non-skid in the aft section, which is what USA 829 opted for, while NOR 800 went for the full Sail22 Foam Deck. We also offer a full non-skid deck as well for teams preferring the traditional traction. Available for all boats, not just the Melges 24! 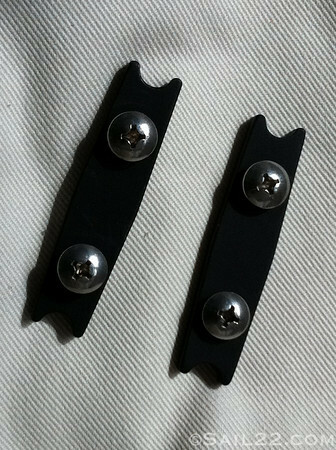 Sail22 Hiking Rail Strips: Add these to the rail to make hiking easier and more comfortable. Great for the Melges 24, Melges 32 and any other boat with legs out hiking. Sail22 Melges 24 Hatch Cover: There are plenty of hatch covers on the market, but we think ours is by far the best! Constructed to have a hinge so that the cover does not become fully unattached from the deck and made out of high quality canvas. Velcro to deck and allows for quicker resealing for the bowman and always stays in place. Sail22 Melges 24 Trampoline: Uka Uka has used a trampoline instead of a spinnaker bag for years. Trampolines are used on bigger boats to keep the kite out of the water that collects in the boat and allow for easy launching and take downs. Teams that have tested ours have rave reviews. Easy to attach with bungee and small pad-eyes we have created with Soak (makers of one of our favorite tweaks, the Soak Halyard Clip). With the trampoline, we recommend our Sail22 Compression Post Cover to make sure the kite does not become stuck on anything down below. Padded Engine Bag $200 *** Designed for a Honda 2.0, but will fit any engine in the 2-2.5hp range. Also available for Torqeedo engines. Padded and vinyl for quick clean up in case of fuel or oil spillage. Handles to carry and also to secure. 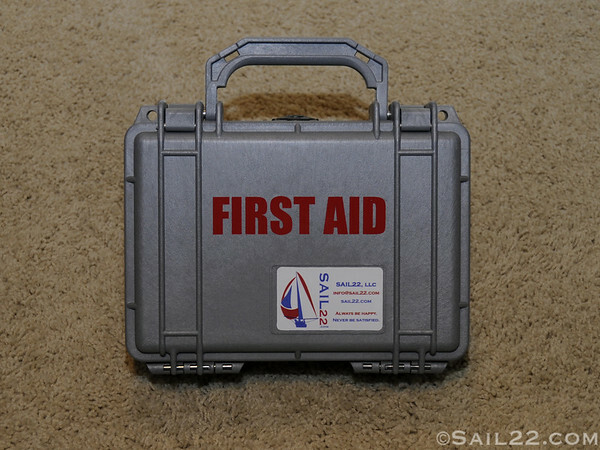 Sail22 First Aid Kit: Most first aid kits are full of things you really don't need (aka fillers). Since Becky is a nurse practitioner and sailor, she has designed a first aid kit that is meant to handle injuries common to sailors on and off the water. 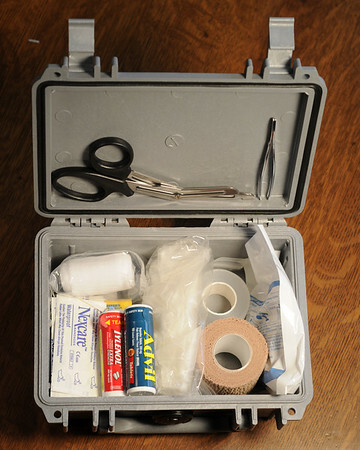 All materials are high quality and not normally found in a common first aid kit. The case is also made by Pelican Cases to be fully waterproof and the whole kit only weighs in at 1.5 lbs. They come in handy when you need them the most! Sail22 Dog Bone: This can be used on any boat and has various applications. We use them on tack lines, main halyards, spin sheets and more. We're always finding new uses for them! They come in multiple colors as well (currently silver, green, blue and red). Sail22 Carbon Rig Adjustment Tool: No need to keep a screwdriver in the crew's pocket to tune the rig now that we make our Sail22 Rig Adjustment Tool. Perfect to add and take off turns quickly on the open body turnbuckles. 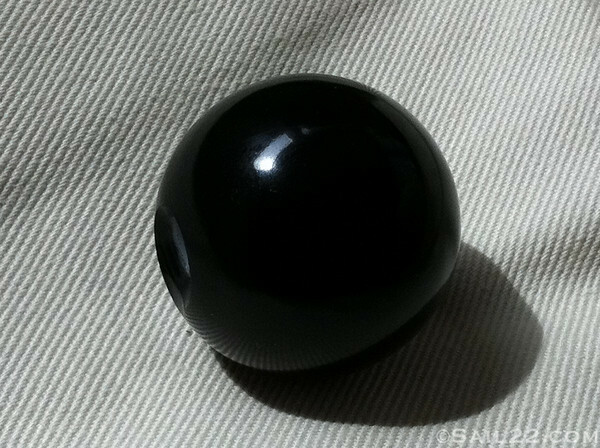 Made of carbon with a lashing line to lash to the boat or to a crew member's PFD. 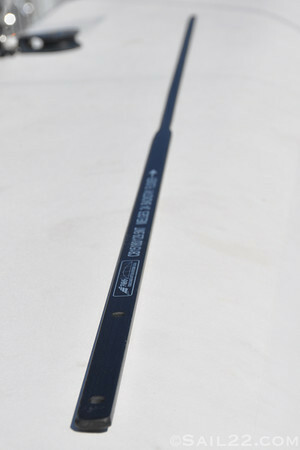 Carbon Melges 24 Backstay Flicker: One of our most popular Melges 24 items. Super light weight and tapered. A tweak where you want at the top of the rig and much more flexible then the traditional flicker to allow for more backstay when you need it. Melges 24 Carbon Jib Block Cover: Our very sturdy carbon jib block cover prevents the spinnaker from being sucked into the jib block on take downs, which can be a very costly error. Only needed on the port side for one design racing. Clear coated carbon looks great and is very functional. If you have ever had the kite stuck in the jib block, you will understand why this is needed! 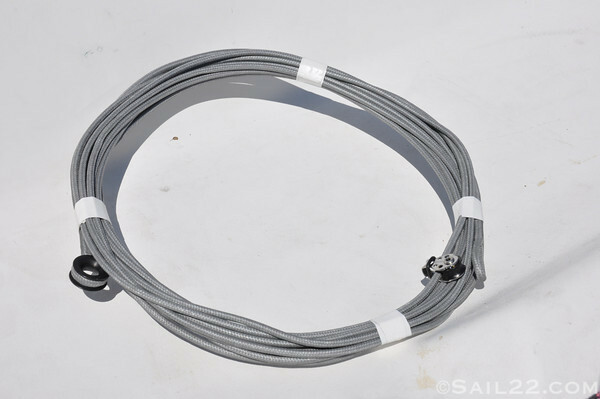 Sail22 Melges 24 Carbon Tack Deflector: This piece keeps the spinnaker from becoming stuck in the lifeline triangle where the lifeline meets the deck on spinnaker sets. No need for bungee across the deck any longer with this device. Ours is made of carbon and glues to the deck (no holes required to be drilled). Melges 24 Carbon Rig Locks: Once the rig is tuned, our Carbon Rig Locks keep the open body turnbuckles from spinning on or off any more than you wanted. Available in 8mm and 10mm to fit both sizes of open body turnbuckles depending on if they are made prior to 2011. Melges 24 Third Hands & Keepers: Our third hands are sturdier than the traditional style (and cheaper too!). They allow the rig to be easier to work with for open body turnbuckles. The Keepers eliminate movement of the shrouds to prevent the third hand from becoming repositioned. Our Keepers work with other manufacturers's Third Hands as well. Sail22 Melges 24 Traveler Brackets: Anodized aluminum brackets that make it easier to work the traveler and backstay from either side so that they are never in the wrong place. Work both traveler or backstay from either side for light air settings. No block needed like other manufacturer's brackets. Sail22 Keel Guards: We've been working to perfect the best way to protect Melges keels and think we have found it. Our Sail22 keel guards provide front and back, as well as side stability to secure the keel in place while traveling. 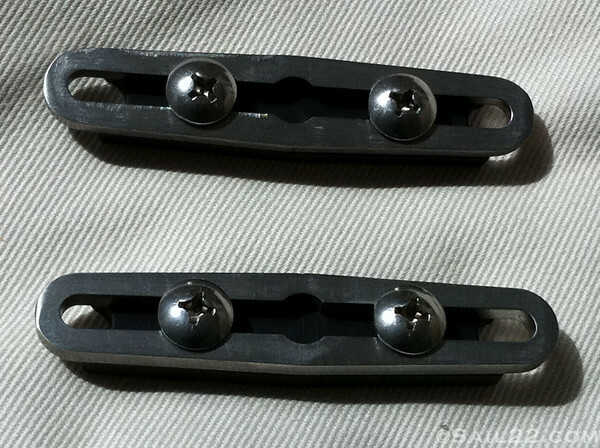 Sail22 Turnbuckle Covers: We try and stay away from anything metal (ie. grommets), so our Sail22 Turnbuckle Cover is made out of high quality canvas and has a loop with lashing line. This keeps the cover from falling in when tuning the rig. Sail22 Forestay Triangle Cover: Our Forestay Triangle Cover prevents water from coming in to the area around the furler. It's amazing how much drier the boat is with this piece in place. Velcro in place for easy on and off. Sail22 Forestay Turnbuckle Sleeve: This prevents the spin sheet from catching on the furler drum during gybes. A sleeve to make sure things run smooth and better than a water bottle or garden hose! Sail22 Melges 24 Stanchion Ball: A very simple way to keep the kite from catching on the front port stanchion during sets and take downs. Sail22 Ultra Light Megles 24 Backstay: (0.46 lbs with micro-cleat attached) Super light and covered. We developed our Ultra Light Backstay with a special line after not being satisfied with the original vectran and PBO options due to the breakdown that occurs of the fibers in UV light. Sail22 New England Ropes Rigging Package: We offer full service rigging for all boats. Custom designed based on your preferences and our recommendations. Dock Boxes: Custom made dock boxes are available that fit the Melges 24 trailer. Our favorite is a gray (which is on USA 829). Add vinyl team graphics to customize your dock box even further for easy recognition. We also offer dock box brackets (one set per box) that are $160. The Sail22 Harken Soft Dock Box. While working with Harken to design the covers for the J/70, we created this portable soft dock box with lightweight tent pole structure. Loops on the side to secure to the dock and a top flap that zips on the front to keep water from entering. The bottom is also water resistant to help keep your gear dry when it's on the dock. Available in sizes small $300 and large $450. Sail22 Tuning Stickers: Why mark up your hull with a sharpie when you can have Sail22 tuning stickers? We make them for the jib cars, backstay, jib trim and traveler markings and rig tuning guides (just let us know which sail maker you use or we can do a custom one with your numbers). Sail22 Flush Mount Velocitek ProStart or Tacktick Micro Bracket: Allows you to mount a Velocitek ProStart or Tacktick Micro directly onto the mast to keep it clear of halyards. When used with both Tacktick and Velociteck, it allows both screens to be at the same distance from the mast versus sticking out due to the traditional bracket size. Sail22 Carbon Double Cleat Spinnaker Bracket: In big breeze, the spinnaker halyard can slip leading to a mess when it's not needed. An easy fix is to double cleat and the Sail22 Double Cleat Spinnaker bracket is made of carbon and uses the same fasteners as the traditional Melges 24 bracket. Use the existing cam cleat and add a second one to the bracket. Vinyl Logos for Hull and Sails: Custom graphics for your hull, cockpits, sails, dock boxes and more. We have the ability to cut large graphics in house and apply them prior to your next event. Custom Painted Tillers: A favorite request in our Sail22 Speed Barn. Do you want your tiller to stand out with a special color or design? Vinyl graphics or airbrushed designs can be added during this process to make your tiller stand out! These are just a few of the custom parts and options we offer to clients through Sail22. We enjoy working with clients one on one to make sure their boat is exactly the way they want it set up or overhauled. Please check out our website at www.Sail22.com for further offerings to teams such as gear, logistics, coaching and photography. We can be reached any time of the day by email at info@sail22.com and we're quick to respond to phone calls too at 574-889-0022.